State legislative websites have potential both to inform the citizenry and increase their participation in the governing process. This is particularly the case with respect to budget deliberations, which traditionally have been shrouded in mystery. Previous studies as well as a direct review of websites over the last few years have shown an increasing amount of data available. It ranges from basic information such as member lists and calendars to full documentation of events via transcripts and archived audio or video. A survey of state fiscal officials confirmed the utility of these websites for providing information. Thus, the websites have reached half their potential. However, the web sites do not appear to have enhanced citizen participation in the process. Opportunities for feedback and interaction are minimal at best. 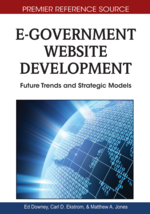 The implementation of such tools would enable the websites to reach their full e-government potential. Budget deliberations occur during the budget process after budget information has been presented in some form to legislative decision-makers, and it is the discussion and negotiation that occurs in this step in the process that inform budgetary decisions about how resources are allocated in budget outcomes. The focus of research in this area has been on linking budget deliberations to budget outcomes. Previous research examining budget deliberations has focused on the effects of the way budget information is organized, the budget format, on subsequent budgetary decisions. Grizzle (1986) was among the first to review the deliberations of budget committees in state legislatures. Examining selected Florida and North Carolina legislative committee hearings, she described a two-step process in which budget format would influence the content of discussions in the budget review process, and the content of budget deliberations would influence the budget decisions that determine how much money is appropriated. She found that budget format is an important factor influencing the nature of budget deliberations. She viewed this initial step as an intervening link between budget format and ultimate appropriations decisions that needed to be better understood before trying to understand the second step linking deliberations under different formats to appropriations decisions. Only a few other studies of budget deliberations have occurred at the state and federal levels. Stanford (1992) built upon Grizzle’s research by reviewing budget deliberations for 1982, 1983, 1984, and 1987 in Florida. She reviewed over 12,000 questions asked by legislators during those four years. She found discernable patterns reflecting distinct orientations in legislative deliberations over agency budget requests. These patterns varied depending on factors such as fiscal conditions, agency mission, and type of funding sources. Implicit in these findings is the fact that the participation of legislators in the budgetary process appears to be more involved and more strategic than previously considered. In examining Congressional budget deliberations in selected subcommittees, Pettijohn and Grizzle (1997) and Ahmad, Grizzle, and Pettijohn (2003) found that information presented in a particular format becomes the object of deliberation during the subcommittee hearings. This in turn influences the budget deliberations.